A hate shopping. Hate it. Really. That said I’m actually pretty good at buying gifts for other people. Of course, this means that I’m shopping for specific people. My father-in-law loves history and works with wood, think Foxfire. My mother-in-law is into classical music and elegant history, much more Biltmore than Foxfire. Now try to come up with something any one of 20 or so people would love. Let’s just say that the only thing my mother-in-law and son have in common is that they both like cats and love to eat. This is mission impossible! But then my son suggested buying a can of Flex Seal. What? I hadn’t thought of ridiculous made for TV products. Serious gifts that everyone would love? Not going to happen. But the ridiculous? This just might work. It is far too easy to let someone’s request dampen our holiday joy. It is up to us to rediscover God’s presence and the spirit of his grace that not even the thought of shopping can entirely eclipse. It’s a new year! Well, sort of. Advent marks the start of a new liturgical year in the Catholic Church. I suppose it is apropos that the new year begins with waiting. We spend such a vast amount of time doing it, after all: waiting in line (or “on line” if you’re from the Midwest), waiting for doctors and plumbers and cable repair persons, waiting for mail to arrive and children to get dressed and pets to do their business. Waiting to eat, to sleep, to give birth, to die. All of life is waiting, in a way. Advent merely provides additional practice. But what are we waiting for? For a child to be born into a manger? That already happened. For that child to come again? Yes, but that’s constant, not necessarily Advent-specific. I think we’re really waiting for a change of heart. Remember how you felt at Christmastime when you were a child? Remember when just seeing lights strung on houses and carols being sung could lift your heart right up to your throat? Somewhere along the line, we lose that sense of wonder. How can we get it back? Maybe that’s the challenge of Advent. My father-in-law was manning the bell and kettle for the Salvation Army one Christmas, outside of a store, when a little boy — obviously disabled — came struggling up to him. In his mittened hand, he held a clutch of crumpled dollar bills. His mother explained that it was his Christmas money; he wanted to donate it to people who really needed it. My father-in-law still tells this tale with tears in his eyes. This advent, I am waiting for that little boy — his spirit, anyway — to rise up in me like a tide and wash away my grown-up skepticism and wariness. I want to receive Christmas as purely and joyfully as a child. And I want to give away that pure joy as rapidly as it spools into my heart. I think that’s a worthy thing to wait for. Don’t you? I have to admit it. I adore Christmas. Adore it. It is the one time of year that I get into glitter and shimmer and WOW. Otherwise, I’m a denim, battered boot kind of girl. But Christmas draws me in. Tomorrow I’m heading into the basement on a quest for our advent wreath. We’ve had this same wreath since my teen was a baby but then again it is a silver pillar plate. On it we place votive candles. Did you know votive candles were first made to light in prayer? A ring of prayer candles on a plate. It helps me remember to turn to God in prayer even when things are crazy hectic. And I’m making a new outdoor decoration. I love the lights. Just love them. But the decorations that draw me in? Nativities and stars. Snowflakes and light strings. Our new piece is a pallet painted with a star and strung with solar lights. Yep. I’m even nerdy and green at Christmas. But what may be the best part of Christmas? When people remember those who have less. Who are in need. Our church helps fill backpacks for children taken into foster care. We’ve already delivered the crib full of coats. We always have a food barrel but now is when it gets a real workout. Take the time to slow down for a moment here and there this holiday season. Center yourself on the why of it all. And go into the world with the peace and love that are His call to us all. When the commercialism gets to you, return to that focus. Make this Holy season your own. I’m doing again. Trying to buy Christmas, that is. Trying to bring home God-made-manifest in a series of shopping bags. Trying to echo God’s ultimate gift of love with stuff hauled in from the local mall. It is, of course, an endeavor doomed to failure. Even the Grinch realizes by the end of the story that Christmas doesn’t come in a gaily-wrapped package. But even knowing that at a cellular level doesn’t stop the rampant commercialism of the holidays. You feel the tug of it everywhere you go. How can I show the people I love that I love them? How about a brand new set of knives! It’s enough to put a damper on anyone’s spirits. Gift-giving becomes a burden, rather than a joy. So where do we find Christmas if not under a tree? Inside of ourselves. And how do we kindle that spark while being simultaneously bombarded by cookie-baking, house-trimming, gift-wrapping, covert buying and endless card-addressing? I wish I had an answer to that. Maybe it’s a little like touching a butterfly: You can chase it around, offer bait, call out to it…and nothing is likely to happen. But if you just sit still and wait, quietly and patiently, it may very well land on your outstretched hand. As the calendar turns to December, let us not chase down Christmas with a net and a cage. Go where the season pulls you — to church, to volunteer opportunities, even to a cozy evening on the couch with Truman Capote’s A Christmas Memory. Tell your loved ones you love them. 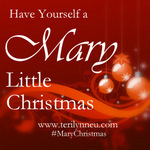 Let God find you this Christmas, waiting, ready, snug as a manger filled with fresh hay. Maybe it’s because we cleaned out my Dad’s house, more or less, this past year. Maybe it’s because my mother-in-law moved back to town and gave many of her treasures to her children. Maybe it’s because my house, larger than the one I grew up in, is FULL with a capital F. But this quote makes a lot of sense to me at this point in my life. Stuff is not the answer. Giving back is the answer. That’s something I’m think about as we had into this holiday season. What do I want from my husband? I want the light and fan put up and the patio cleaned up so that we can better use the space. I want to eagle watch in January. I want to head out to Osage and visit one of my friends from junior high. She lives in the town where my grandmother grew up. So don’t buy me stuff. Get a poor family a goat. Contribute to a literacy program. Make a donation to the local food pantry. That’s how I’d prefer to celebrate this season. If you push me for what I want, all that sounds good is some sparkly lights, a plate of cookies and some music. Those miniature mangers we keep around our homes at Christmastime are liars — they make us forget that the three kings (or magi) never hovered around Jesus’ birthplace to adore him along with the shepherds, angels and various ungulates. It took them time to get where they were going. In this, I understand and sympathize with them. It takes most of us time to see the way to God — years and years and years. As such a sojourner, I felt compelled to compose the following. with only my body of stardust to give.